The County class was a class of guided missile destroyer, the first such vessels built by the Royal Navy. Designed specifically around the Sea Slug anti-aircraft missile system, the primary role of these ships was area air-defence around the aircraft carrier task force in the nuclear-war environment. The class was designed as a hybrid cruiser-destroyer, with a much larger displacement (similar to that of the Dido-class cruiser) than its predecessor, the Daring class. During the final design period in 1956 - 1958 a full gun armament was envisaged, based on a modern combined gas turbine and steam turbine ('COSAG') propulsion unit, as enlarged Daring fleet escorts, armed with 2 twin Mk 6 4.5, 2 twin L/70 40mm and a twin 3 inch/70. 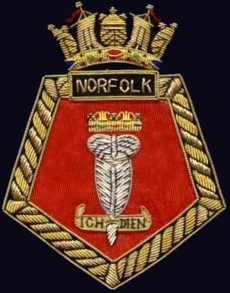 Only as late as 1958 was the decision made to fit the ships with guided missiles on the insistence of the First Sea Lord, Admiral Mountbatten and the Cabinet, despite staff reports over missile unreliability and inaccuracy, and the vulnerability of the above-waterline missile magazine. 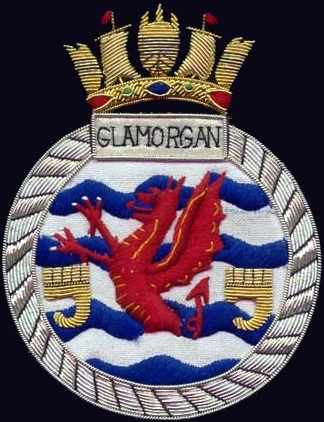 Lord Mountbatten believed that describing the County class as destroyers rather than cruisers, and demonstrating the apparently impressive performance of Sea Slug on the missile range against Gloster Meteor UC15 drones, he could justify a modern Royal Navy and a large number of County class 'destroyers'. While short on the support and logistic spares stocks of a traditional cruiser, they were still envisaged by the DNC as being 'probably' used in the cruiser role with space for Flag staff offices, and admiral's barge accommodation in the 1960s: the last decade when the UK oversaw significant colonial territory ("East of Suez"). Its missile capability had been overtaken by aircraft development by 1962-63, when HMS Devonshire and Hampshire entered service, but in the early and mid-1960s the modern lines of these guided-missile destroyers, with their traditional RN cruiser style and their impressive-looking missiles, enabled the overstretched Royal Navy to project sufficient power to close down the threat of a militant, left-leaning Indonesia to Malaysia and Borneo during the Indonesia-Malaysia confrontation. Eight vessels were built in two batches between 1959 and 1970, the later four vessels carrying the improved Sea Slug GWS2 and updated electronics requiring rearranged mastheads. The major identifying feature was the Batch 2 vessels' prominent "double-bedstead" AKE-2 antennas of the Type 965 air-search radar, and their taller foremast carrying the Type 992Q low-angle search radar. The County class was designed around the GWS1 Sea Slug beam riding anti-aircraft missile system. Sea Slug was a first-generation surface-to-air missile intended to hit high-flying nuclear-armed bombers and shadowing surveillance aircraft like the Tupolev Tu-95 "Bear", which could direct strikes against the British fleet from missile destroyers and cruise missile-armed submarines. Bears were formidable targets for a missile like Sea Slug; the long-range Soviet turboprop aircraft flew at an altitude of 7.5 miles, at 572 mph (921 km/h) and were barely within the engagement capability of Sea Slug. The Sea Slug system was a large weapon. From the missile itself-6 m (19 ft 8 in)-long and weighing two tons, to its handling arrangements and electronics systems - even fitting a single system aboard a ship the size of the Counties was a challenge. The missile was stowed horizontally in a large magazine that took up a great deal of internal space. On the last four ships, some of the missiles were stored partly disassembled in the forward end of the magazine to enable the complement of missiles to be increased. These missiles had their wings and fins reattached before being moved into the aft sections of the handling spaces and eventually loaded onto the large twin launcher for firing. The electronics required for the Sea Slug were the large Type 901 fire-control radar and the Type 965 air-search radar. These required a great deal of weight to be carried high up on the ship, further affecting ship layout. According to the Royal Navy architect, "Sea Slug did not live up to expectations" and was obsolete by 1957. Its ineffectiveness and dangerous missile fuel degraded the value of the class, which had potential as command ships, having more operations room space than later Type 42 destroyer and ADAWS and the MIL-STD-6011 communications system. In 1960, because US-designed missiles were seen at the time to be superior to the Sea Slug, the Royal Australian Navy (RAN) proposed a County class armed with the US Tartar missile and two additional modifications: hangar space for three Wessex helicopters and a steam propulsion system, rather than the combined steam and gas system used in the County class. However, the RAN instead decided to proceed with the Perth class (a modified version of the US Charles F. Adams class). Two different reasons have been put forward for the Australian decision: according to an Australian history, British authorities would not allow a steam-propelled variant of the County, whereas, according to a British account, the re-design required to accommodate the Tartar missile would have taken longer than the RAN deemed to be acceptable. The US Terrier missile had some support amongst the RN staff, but consideration was not given to acquiring it for the second batch of four ships, as the County class were 'shop windows' for advanced UK technology, and it was vital for the British missile and aerospace industry to continue the Seaslug project, to allow the development of the much improved Sea Dart missile. Following problems with the original version, a reworked Action Data Automation Weapon System (ADAWS) was successfully trialled on HMS Norfolk in 1970. In the mid-1960s the County missile destroyers were assets; their impressive appearance and data links, feeding off the carriers' Type 984 radar, projected effective capability during the Indonesia-Malaysia confrontation. The Mark 1 Seaslug was operationally reliable and proved useful as a missile target for the new Sea Dart missiles in the late 1970s and early 1980s. (The supersonic Mark 2 version proved less effective for this.) There are questions as to whether it was ever fully operational and there were problems with missiles breaking up when the boosters separated. Inaccuracy, primitive beam-riding guidance and lack of infrared homing or a proximity fuse in the Mk 1 made it of limited value. Short-range air defence was provided by the GWS-22 Sea Cat anti-aircraft missile system, which made the Counties the first Royal Navy warships to be armed with two different types of guided missile. As constructed, the County-class ships were armed with a pair of twin QF 4.5-inch gun mountings. The second batch of four ships (Antrim, Fife, Glamorgan and Norfolk) were refitted in the mid-1970s - their 'B'-position turrets were removed and replaced by four single MM38 Exocet surface-to-surface anti-ship-missile launcher boxes. This was partly to counter the continuing threat of Soviet gun- and missile-armed cruisers, but also because the two twin 4.5 mountings, located forward on the County-class, were cramped and hot to fire, with the heat from firing the upper gun being felt by the gun crew in the turret below; also, the forward twin turrets had space for only small magazines - only 225 shells for each gun, two-thirds of the magazine capacity for the same guns in the Leander (Type 12L) frigates. This made the County-class ships the only Royal Navy ships to be fitted with three separate types of guided missile: Sea Slug, Sea Cat and Exocet. It also left the un-refitted ships as the last Royal Navy vessels able to fire a broadside from multiple main armament gun turrets. 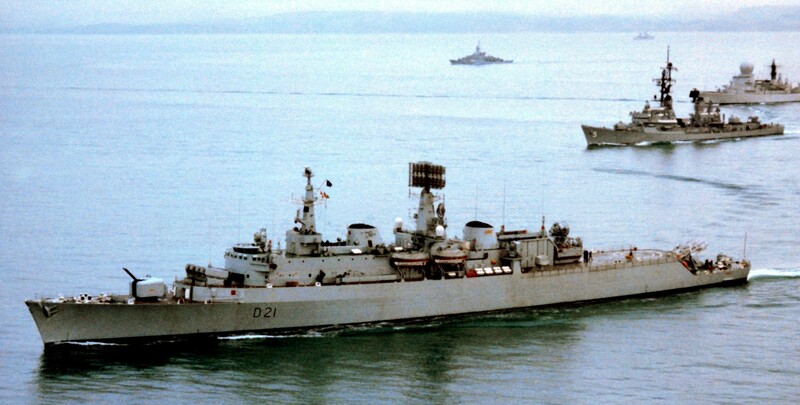 HMS London fired the last Royal Navy broadside on 10 December 1981 in the English Channel, after returning from its final deployment in the West Indies. It had also fired off the last Sea Slug Mk 1 stocks that year, as targets for Type 42 Sea Dart workups, prior to her hand-over to the Pakistani Navy. 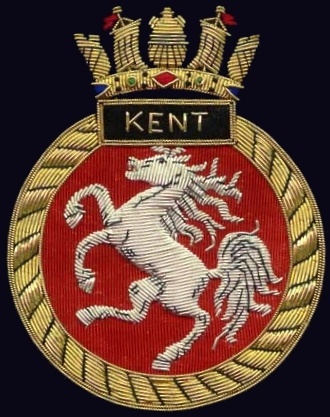 Sold by the British Government 23 March 1982, she sailed without notice from Portsmouth in late May 1982 for Pakistan during the Falklands crisis, and consideration may have been given to reclaiming it for war service.